When did you learn about OE? I first came across PowerWood when my daughter was very young. Simone was giving a workshop at the home-educators’ camp, HESFES,and I went along because I was interested in parenting and child development. It wasn’t until later that I began to suspect that my own daughter might have OEs. When she was about four and a half, Leilah began to have almighty angry meltdowns from which she would take hours to recover. It was as if the meltdowns were the result of her storing a lot of emotional stuff I wasn’t aware of, which would suddenly explode. The alarm bell went off for me when, during one of these outbursts, my daughter told me that she wanted to end her life and that life wasn’t worth living. I was so shocked. What could have prompted a four-and-a-half year old to say such a thing? I couldn’t comprehend where such depth of emotion had come from. She was so overwhelmed by her feelings, she wanted to end her life! It took her some time to recover from this meltdown. After that, I began began listening to Simone’s workshops and reading the PowerWood pamphlets about OE with a new focus, and we went to our first PowerWood camp. What OEs does your daughter have? Leilah has a huge imagination, feels things intensely, and she’s very physical. She’s always climbing, dancing, swimming, singing or running around in the park. Even her choice of musical instrument, the drums, is very physical. Although Leilah can sit still if she needs to, she’s at her best when she’s doing something physical. Leilah also expresses her psychomotor energy in the way she talks. She loves to talk. Looking back, I can see that I also had psychomotor OE as a child. As well as being very physical like my daughter, I also channelled my energy into artistic projects. How has PowerWood helped your family? PowerWood has been a powerful force in our lives. We’ve been to the summer camp twice now. What I’ve learned about OEs has definitely enhanced my relationship with Leilah. I like that you can absorb lots of information about OE in a short time at PowerWood camp. The more I know about OEs, the better I understand my daughter. The camp is also a great opportunity to spend time with other families who understand the sensitivities and intensities of children who have OEs, and for our children to meet other children like themselves. Because Leilah is outgoing and articulate and will chat with anyone, anywhere, she seems very confident. But as I’ve learned more about OEs, I’ve become aware that sometimes Leilah’s over-talking is an expression of her not coping. This awareness allows me to step in occasionally and offer her support before she has a meltdown. Leilah’s meltdowns are relatively infrequent compared with some children I know, but when she does have one they’re intense. Now that she’s ten and dealing with pre-teen issues like more complicated friendship dynamics, and why she can’t have a mobile phone yet, her meltdowns have become more regular. I like knowing that PowerWood is there whenever I need some extra support. For example, about a year ago our home was burgled. I was shocked by how badly the break-in affected Leilah – she was unsettled for a very long time afterwards. She wouldn’t sleep in her own room because if she woke up in the dark she was scared there was someone there. This went on for so long, I was struggling how to help her, so I turned to Simone for help. 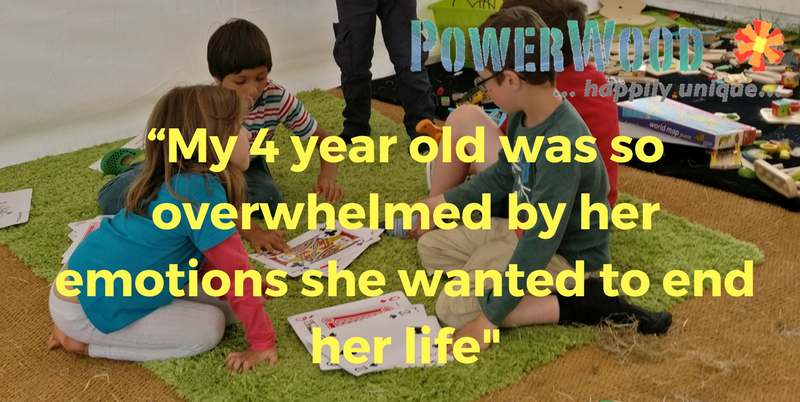 PowerWood has also helped me feel more confident about my parenting choices, for example our decision to home-educate. Although there were no issues while Leilah attended school, I could see that some of the teachers didn’t like the way she’s confident talking with everyone on the same level. Some adults seem to feel that children should be subservient, and I suspect that some of them were, maybe even without realising it, subtly putting Leilah ‘in her place’. But I can see that my daughter’s outgoing personality is a real advantage, and I don’t want it to be squashed out of her. So you see your daughter’s OEs as positive? Definitely. I love Leilah’s boundless energy and her ability to talk to absolutely anyone. Every day we’re out and about doing something physical. And ever since she was tiny, Leilah’s made friends wherever she goes – on the train, in the park, at the bus stop, at children’s parties, at adult parties – everywhere! What a fantastic way to be.